Dunan is a temperate region situated north of Toran and East of the Grasslands. Northern Dunan is occupied by the Highland Kingdom, which has the Holy Kingdom of Harmonia as its northern neighbor. The first kingdom to claim this territory was the Dunan Monarchy led by King Bernand. However, the Dunan Monarchy steadily declined in power, giving rise to numerous republics which took the form of city-states. The fragile balance of power was tilted when Maroux Blight established the Highland Kingdom in Solis 237 as an aggressive military power. Maroux Blight invaded the Dunan Monarchy and easily defeated them, annexing eastern Dunan in the process. Soon later, rebels captured South Window Palace and brought an end to the Dunan Monarchy. Since then, the city states learned to cooperate in order to resist attacks from the Highland Kingdom--leading to the formation of the Jowstone Alliance in Solis 314. The Muse Principality is the largest region in Dunan, divided into a central region and an eastern region. The two regions are somewhat different in culture. The capital, Muse, is located in the central region along with Coronet, an important port city. Trade routes between Matilda, Greenhill, and Highland all converge at Muse. However, the eastern region is largely neglected due to its low strategic and economic value, which makes the area a safe haven for bandits. This region has a relatively temperate climate. Muse Principality has traditionally been the leader amongst the Jowstone Alliance, partly due to history, but largely due to the fact that they are at the frontline against the Highland Kingdom. The flag of Muse depicts a huge tree which used to grow on Jowstone Hill. SARSadmin's Comment: The Land of Arlus of Dunan, it even has Gouran attached to it on the east side. However, this place is a lot more hostile with Highland and Matilda to the north. Muse is the largest city among the Jowstone Alliance, and is a center of trade. The city existed from before the formation of the Jowstone Alliance. Muse beat back attacks led by Maroux Blight of Highland nearly 200 years ago by the bravery of General Jowstone. This was the reason for the naming of Jowstone Hill and the Jowstone Alliance. Since the formation of the Jowstone Alliance, the conference hall at the summit of Jowstone Hill has been the symbol of unity between the allied city-states. During the Jowstone-Highland war, in the year 434, Jowstone Hill was the place of truce between Mayor Darel and King Agares Blight of Highland. The two nations decided to end the conflict by a duel between their respective heroes, Genkaku and Han Cunningham. Han Cunningham won the duel, which resulted in Kyaro belonging to the Highland Kingdom. Since then, the office of mayor passed to Darel's daughter, Annabelle. However, the Highland Kingdom increased its aggression against Jowstone starting around the year 460. The very same year, Highland attacked Muse, resulting in severe defeat and the death of Annabelle. The death of Jowstone's leader devastated the unity of the Alliance, and resulted in Highland having easy victories over Greenhill and South Window. However, due to the newly formed Allied Army, Muse was eventually taken back. Sadly, soldiers who returned to Muse often had no family waiting for them due to Luca Blight sacrificing many of the citizens to the Beast Rune. Because of this massive slaughter, Muse's population decreased by two-thirds by the end of the war. Coronet is a port city where a lot of goods from the south are brought in for further shipment to the north. During the Dunan Unification War, the city was occupied by the Highland Army for a few months, and it was one of the cities that were liberated towards the very end of the conflict. Ryube is a small hunting village located towards the eastern edge of the Muse Principality. The village functions as one of the few travel stops for the few travelers that travel between Highland and Dunan through the North Sparrow Pass. A well known spear master by the name of Tsai is said to live in the forested hills behind Ryube. The forest adjacent to Ryube is an excellent hunting ground for wild boars, and hunters are often seen in the woods. The village was destroyed by raiding Highlanders during the Dunan Unification War. Efforts for reconstruction continue. Toto is a small village that bridges the two regions of Muse Principality. Although the village links two regions, it is considered to have little importance due to the low strategic value of eastern Muse. This village housed the Rune of the Beginning, sealed by Genkaku and Han Cunningham after the Highland-Jowstone War. During the Dunan Unification War, the halves of the rune ended up in the hands of Riou and Jowy Atreides; shortly after the village was destroyed by Luca Blight's White Wolf Army. SARSadmin's Comment: Not to be confused with a toilet manufacturer brand, the place where the "Pilika mystery" takes place. What triggers her appearance? 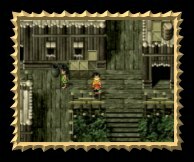 Many Suikoden fans struggle over this perplexing mystery. The Mercenary Fortress was built recently by Viktor. The fortress was built at the request of Annabelle to make sure the eastern portion of Muse Principality was adequately protected from Highland. The fortress was then under the Highland Army's control for a while until Luca Blight was defeated by the Allied Army. The fortress became the final battlefield for Kiba Windamier, who protected it as a decoy to lure Leon Silverberg out of Highland. SARSadmin's Comment: A place where many rabbits are slaughtered for their double beat runes. An important Checkpoint between Highland and Muse. This was the place where many of the battles between Jowstone and Highland took place. In the year 432, the forces of Darel came through this checkpoint, pursuing the defeated army of Robert Blight. Kiba Windamier ambushed Darel's forces from the flank and drew him to Fort Retto, which allowed Robert Blight to escape. SARSadmin's Comment: A checkpoint manned by an easily bribable soldier (Nash Latkje passed through here with 2000 potch). SARSadmin's Comment: Vaguely known as "the place where Meg and Gadget are recruited." 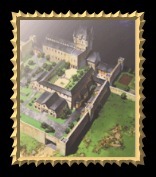 Greenhill is one of the newest city-states, and was a part of Muse until about 100 years ago. Greenhill Principality has always been known as a place of study due to its academy. Historically, the academy was created to educate future politicians, diplomats, and other government officials for the future of Jowstone. 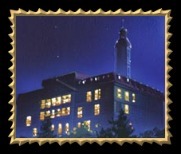 The academy is currently known as the New leaf Academy, but it used to be called the Greenleaf Academy. The principality was formed due to cries of "separation of education from politics," and the region broke off from Muse, joining the Jowstone Alliance simultaneously. The region relies heavily upon the academy, but enrollment has fallen due to recent political tensions between Jowstone and Highland. This, coupled with recent droughts has hit the finances of Greenhill Principality very hard, weakening their political influence. SARSadmin's Comment: A region of academics and forests--sounds like Ann Arbor, Michigan... I wonder how this place exactly borders the Grasslands. Even Nash seems to have used this secret pass into the Grasslands. During the Dunan Unification War, Greenhill was initially attacked by Highland's 4th Army led by Rowd. However, Rowd's attacks were countered by Greenhill citizens led by the cracker-box strategies of Nash "Silverberg" who was "hired by Greenhill for a million potch." However, the city fell later on due to the strategy of Jowy Atreides. 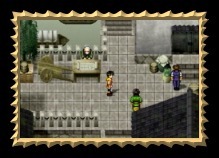 SARSadmin's Comment: Greenhill is one of my favorite locations in Suikoden, largely due to the academic ambience. The academy has some problems though if they allow their teachers to be scantly clad. SARSadmin's Comment: An entire town that has nothing to do with the main plot of the game. 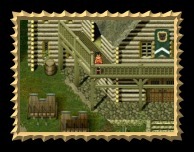 The naming of this village reminds me of the "Great Forest Village" in Suikoden 1. 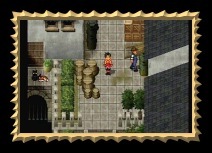 Does this mean we will have something very similar in Suikoden 3? SARSadmin's Comment: A place where you can get "Dragon Armor" very early if you use the Matilda Trick. Why the hell is Badeaux standing there all the time? Southwindow Principality has the longest history amongst the Jowston Alliance. The region used to be ruled by the Dunan Monarchy, which at one time expanded to encompass present-day Two-River Principality and eastern Muse. However, the Dunan Monarchy steadily lost power after the creation of Highland. The Dunan Monarchy ended when citizens of Southwindow rebelled against their Monarch, establishing a city-state. South Window was among the first members of the Jowston Alliance, and has always had great political influence. Southwindow has been at war with Toran quite often, fighting against the Scarlet Moon Empire during and after the Succession War, during the Gate Rune Wars, and against the Toran Republic after the Gate Rune Wars. The causes of these conflicts are largely territorial due to the badlands between Toran and Southwindow being masterless. In the most recent conflict with the Toran Republic, Southwindow fought alongside Tinto, but withdrew from the war, which angered Tinto. This resulted in bitter resentment between the city-states, creating the foundation for the eventual fragmentation and destruction of the Alliance. South Window's flag symbolizes the four rivers that flow into Lake Dunan. SARSadmin's Comment: Looking at the history, you would think that Granmeyer must have been one blood-thirsty mayor. How can he have been a pacifist if he has been involved in four different conflicts? SARSadmin's Comment: This city changes owners so often that no sane person would want to be living here. Not many people know that the Darkness Rune goes on sale here later in the game." North Window is an abandoned ruin which used to be a busy town. Having a history of defeating invading Scarlet Moon troops, North Window was well known for its strong soldiers. However, it became a target of Neclord's bloodlust, reducing the once-affluent town into a massive graveyard. Since then, North Window has been abandoned for more than a decade until citizens of South Window started to disappear. Granmeyer sent a team to investigate the ruins. The team included Viktor, the sole survivor of Neclord's massacre. The team discovered Neclord and defeated his summoned minion. Southwindow fell to Solon Jhee during this investigation, and Southwindow forces fled to Northwind. Northwind was quickly made into a fortress, and soon became the focal point of the new Allied Army. SARSadmin's Comment: There is a small section between the main town and the sluice gate section that requires some CD load time, what is that short section there for? Due to all the activity, crime has become an issue in the back streets of the city. SARSadmin's Comment: What the hell are those samurais you fight against? Any background info on who they are!? The Matilda Knights were first created to protect members of the Jowston Alliance. However, they soon became a political force within the alliance and formed their own region in northern Muse, which became known as the Matilda Knightdom. The Knightdom has both Highland and the Grasslands as its neighbors, and has engaged in much conflict with both of them throughout its short history. In particular, they used to have routine border skirmishes with Highland. SARSadmin's Comment: The typical case of "The owner getting bitten by their own dog." SARSadmin's Comment: Why Futch and Humphrey were staying in this village for such a long time is a mystery. I mean, what purpose did this village have in their search for dragons? SARSadmin's Comment: Lesson--Never live in border towns. Mt. Rakutei is a small mountain, measuring 370 meters in altitude at its summit. The mountain is perpetually surrounded by thick mists, which often confuse and misdirect travelers. It is said that a dragon lives on the mountain, but none actually survive to tell the tale. SARSadmin's Comment: "Rakutei" means "The Emperor Fell" in Japanese. The same name is seen in the Romance of the Three Kingdoms, where a mountain is actually named after the fact that Liu Bei or Cao Cao actually fell from the mountain... I can't remember which one it was--they both fall from a mountain. Being one of the original members of the Jowston Alliance, Two River is an old city. Originally a part of the Dunan Monarchy, Two River eventually separated to form its own city-state. Originally, Two River was inhabited only by kobolds and humans, but the Wingers settled into the strip of land between the two branches of Lana River. The Wingers were brought there by the invitation of Genkaku due to Tinto's strip mining destroying their original habitat. The original citizens of Two River look upon the Wingers with suspicion, giving Wingers less voice in politics. Tworiver is governed by three different Houses, each represented by the three races. 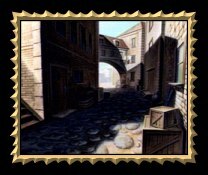 The three houses are in turn represented by the Plenipotentiary, who represents Two River in all Jowston Alliance matters. The military branch has always been headed by the kobold side of Two River. The Two River flag represents the "unity between the three races." SARSadmin's Comment: Yes, the answer to racial problems is to create a new enemy! SARSadmin's Comment: In my first game, it was 113 days since Elza left the letter at the inn, how about you? SARSadmin's Comment: The mayor definitely needs some training if he is capable of being bossed around by Tengaar to the point that he sends his own townsmen to various dungeons for stupid errands. SARSadmin's Comment: An unlikely place for the oft unseen alternate ending. Also known as the "place Shu gets violent." SARSadmin's Comment: This new name was revealed in a small entry in the Suikoden Encyclopedia, what a surprise! SARSadmin's Comment: The end of the road for travelers, and for the life of one gunner. SARSadmin's Comment: Not many players use this pass to get into Highland do they... Also the place where the game begins and ends. SARSadmin's Comment: Remember the Alamo! Tinto used to be a member of the Jowston Alliance, but decided to seek its own destiny after the Dunan Unification War. It virtually no arable land, but generates tremendous income through mining. The Tinto minds also produce extremely rare gemstones called "Water Gems," which are necessary for various magical applications, such as the fabrication of rune crystals. The Tinto Republic has been in conflict with Grassland tribes many times in the past, and continues its campaign of aggression into the Grasslands. SARSadmin's Comment: A nation that is selfish to the end. Interestingly the government is run by the miner's guild, which makes it sort of like a socialist republic. The capital of the Tinto Republic built right into a cliff. The city is run by the Miner's Guild, and the Guild Master is also the President of the republic. The city produces various rare forms of metals, and has its own population of metal working tradesmen. For that reason Tinto is not only known for mining, but also for high quality weapons and armor. During the Dunan Unification War, Tinto was attacked by Neclord's zombie horde. However, Neclord was defeated by the combined efforts of Sierra Mikain, Kahn Marley, and Viktor. SARSadmin's Comment: Why does there have to be a church!? Another mining town inside the Tinto Republic, Crom produces gold by sifting through the Lana River. For that reason, gold is often traded in the trading center. Crom was attacked by Neclord's zombie horde during the Dunan Unification War, and was briefly the headquarters for the Allied Army after their retreat from Tinto. SARSadmin's Comment: This is where the "running away from Tinto" alternative event starts. It is worth trying if you have never attempted it, because you can see Marlow wielding a sword. A small village at the foot of Mt. Lampdragon. The village was once attacked by Neclord's zombie horde. The villagers fought back, but the zombies eventually gained the upper hand, taking over the village. SARSadmin's Comment: If you want to be cruel, fight against the zombies as long as you can to see villagers die one by one. The Tinto Mines is host to many monsters, but is also the source of the massive wealth that the Tinto Republic hoards. The depths of the mines lead to a cave where a mysterious race of intelligent Octopi lives in relative peace. It is also rumored that a powerful Wizard lives in the depths of the cave. SARSadmin's Comment: Why does that golem have its own FMV? A mountain pass that connects Tinto to Two River. It used to be the territory of the Lamp Dragon Bandits, but after the Dunan Unification War it became safe for all travelers. SARSadmin's Comment: A place of intense events depending on what path you take. A fort owned by the Lamp Dragon Bandits, which was burned down by the hands of the bandits themselves when Neclord's zombie horde attacked them. SARSadmin's Comment: Literally means "fortress."